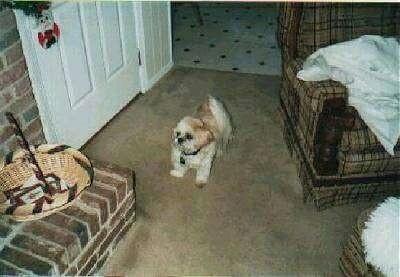 Rambo, A very unlikely name for a Shih Tzu. We sort of inherited him from my youngest son and his wife when they went to England. There being a rather lengthy quarantine for dogs going into England, they did not want to put him through that. So, being the dog lover that I am (and a sucker for my Rambo, even before he was mine) we agreed to keep him for them. 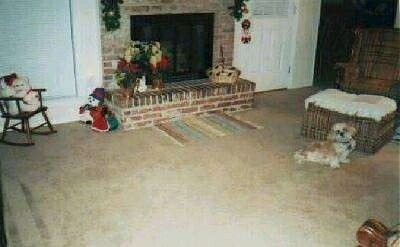 We had Rambo in our home about two years before he had his first gran mal seizure. Having had another dog (part English Setter and part ?) that suffered from gran mal seizures, we were very aware of what was happening. We contacted our vet and Rambo was immediately put on phenobarbital. His seizures stopped for about three years. Then they started again. Only this time, they came more frequently. He would have three within a 48-hour period and then not have one for two or three months. Then the cycle would repeat itself. The vet prescribed valium after the seizure to slow down the brain activity. Once again, that helped for a while. The last medication our vet prescribed along with a reduction of the valium once again helped for a while. At this point, I could sense when he was about to seize. On a couple of occasions, I was able to hold him and actual prevent a seizure by talking to him and rocking. Yes, rocking, as in a chair. 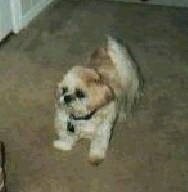 Well, after fighting the seizures for so many years, Rambo left us on October 5, 2000. He is sorely missed and can never be replaced. Oh yes, another dog will be in my home. But none will ever replace Rambo. Knowing what I know about dogs and their seizures that would not prevent me from owning another animal so afflicted. Follow up to "Rambo's Story"
No, Rambo has not been replaced in our hearts by another dog. That could never happen. In fact, I still choke up when I read his story or see a picture of him or even think about him. A stone has been placed in his garden claiming it as his (he loved to roll in the leaves in the fall). We do have two other puppies, however. After we lost Rambo, I stopped by our vet and thanked him for everything he and his folks had done for Rambo. While there, took me back to their kennel area. There he had two very small puppies there. He estimated their age to be about seven weeks. We, my wife and I, were very reluctant to take on a new puppy right away. We were planning a trip to England and would have to board them while gone and didn't think it would be fair to a pup. To make a long story short, a couple of weeks before we went to England, we were again at the vet's. They still had the puppies. One of the girls told us they had kept them because they knew we would be back. The puppies, mixed terriers (believe Rat and Jack Russell mainly) had been found by a dumpster at one of the parks in town by a police officer. When he tried to catch them, the little one, Peanut, was so sick he just put a box over her to keep her from running. The bigger one, Penny, tried to get away from him and almost went down an embankment into the river. He caught them and took them to our vet, calling one of his assistants about 11:30 at night. Dr. Jones was not sure Peanut was going to make it due to her physical condition. Well, they both did and we have two beautiful little dogs. Penny is the protector of Peanut and also disciplines her like an old mother dog. Penny has turned out to be our little watch dog and the demanding one of the pair. Are they spoiled? You better believe it. Are they loved? Yes. We believe they were sent to us by Rambo. Dr. Jones's estimate of their age and the departure of our little Rambo are too close to be just a coincidence. The only concession I had to make to my wife was not to go to the humane shelter any more. I almost brought a one-eyed Peke home on one trip and a 13-year old Pug mix abandoned by the death of his owner on another. I promised. As for our Rambo? I believe in a lot of things other folks don't so just suffice it to say that I know he is watching over these two now and will be waiting at the Rainbow Bridge for me. "Can I go out, please?"